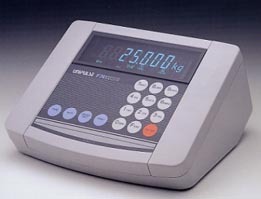 The F741 weighing instrument is full-featured device that offers full numeric keyboard data entry, counting functions, multi-ranging, set-point(s), and HI-GO-LO limit comparators for check weighing. With the capability of powering four (4) 350-ohm load cells (8 each 1000 ohm) the F741 is a powerful instrument for industrial processing, freight yard, and warehousing operations. In addition to the broad range of capabilities detailed above, the F741 instrument is also very fast. With 50 updates per second, and accuracies of 1 part in 10,000d (legal for trade) the F741 can be used in a large number of weighing / counting applications. The F741 comes with a standard serial communication output (SIF) that interfaces seamlessly with UNIPULSE remote displays and statistical/ weight printers. The F741R2 replaces the standard SIF interface with a standard RS232 serial output. Two (2) digital inputs allow for selected entry of the following commands: (1) Tare Off, (2) Gross / Net, (3) Print, or (4) Digital Zero. HI-GO-LO outputs allow for simplified check weighing capability. Supervisors can enter a range into the F741 instrument and the outputs can be hooked into external relays to control lights, buzzers, bells, or other alarm devices to advise the operators of out of tolerance conditions. The desktop enclosure is clean and ergonomically designed. Looking more like a calculator then a computer, the unit is acceptable to even the most computer phobic operators. As a counting scale the F741 is easy to use and capable of providing good counting accuracy with most available industrial scale bases/ platforms. Finally the multi-range capability gives the F741 a capability to halve (1/2) the minimum display resolution for half of the full scale weighing range being used. If you set up the unit to display 10,000 divisions on your display (ex. 0.01 lbs in 100 lbs full scale) then the multi-range capability allows you to display 0.05 lb increments until you reach 50lbs of the full-scale range. This is ideal for manual batching, counting scale sampling, and simply trying to display to the least significant increment. All these features, and a price that is significantly lower then many competitors' products with similar features make the F741 and F41R2 a best buy decision.